Yoveo won big at the Yahoo Sports Technology Awards in London, taking home the prize for Sports Technology Agency of the Year. Yoveo won the award based on its use of iRewind’s mass personalized video technology at the UBS Kids Cup. This award comes after the project garnered the bronze prize for Innovation at the Best of Swiss Web Awards. Every year throughout Switzerland, the UBS Kids cup brings together over 130,000 children to participate in more than 850 track and field events. Yoveo’s award-winning project included UBS volunteers filming thousands of minutes of film of the athletes who ran the 60-meter sprint. The film was then transformed into personalized videos through iRewind’s technology. Each personalized video features close-up shots of the child and her sprint in normal speed and slow motion. Best of all, each child’s performance was presented by the Swiss athletics star, Mujinga Kambundji, as well as a popular sports announcer. Shortly after the run, the videos were uploaded to the cloud, allowing participants to watch their videos on-site on iPads and also at home. The “finisher clips” were also published to UBS Athletics Fan Corner platform, giving participants a personalized memory of their accomplishment as well as a digital souvenir to share with friends and family. The entire production and delivery process is fully automated, enabling a near-to-live delivery of the race videos. “We’re honored to win for Sports Technology Agency of the Year. Yoveo is proud to provide technology solutions for projects such as the UBS Kids Cup. 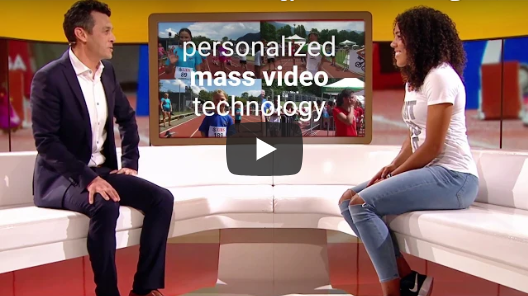 We think it’s an excellent example of how personalized videos can deliver lasting, sharable memories for participants and event organizers alike. This award stands as a testament that Yoveo’s clients can accomplish great things with iRewind’s personalized video technology.” commented Marco Demont, the co-owner of Yoveo. The Yahoo Sports Technology Awards reward innovation in all areas of the sports industry. Founded in 2014, the Awards were the first initiative to celebrate the hugely influential force of sports technology as well as the changes such technologies bring about.